This is a tale beloved by the children of Japan, and by the old folk—a tale of magical jewels and a visit to the Sea King’s palace. Prince Rice-Ear-Ruddy-Plenty loved a beautiful and royal maiden, and made her his bride. And the lady was called Princess Blossoming-Brightly-as-the-Flowers-of-the-Trees, so sweetly fair was she. But her father was augustly wrath at her betrothal, for his Augustness, Prince Rice-Ear-Ruddy-Plenty, had put aside her elder sister, the Princess of the Rocks (and, indeed, this lady was not fair), for he loved only Princess Blossoming-Brightly. So the old King said, “Because of this, the offspring of these heavenly deities shall be frail, fading and falling like the flowers of the trees.” So it is. At this day, the lives of their Augustnesses, the Heavenly Sovereigns, are not long. Howbeit, in the fullness of time, the lady, Blossoming-Brightly-as-the-Flowers-of-the-Trees,bore two lovely men children, and called the elder Fire Flash and the younger Fire Fade. Prince Fire Flash was a fisherman, who got his luck upon the wide sea, and ran upon the shore with his august garments girded. And again, he tarried all the night in his boat, upon the high wave-crests. And he caught things broad of fin and things narrow of fin, and he was a deity of the water weeds and of the waters and of the fishes of the sea. But Prince Fire Fade was a hunter, who got his luck upon the mountains and in the forest, who bound sandals fast upon his feet, and bore a bow and heavenly-feathered arrows. And he caught things rough of hair and things soft of hair, and he knew the trail of the badger and the wild cherry’s time of flowering. For he was a deity of the woods. And again, after not many days were past, Prince Fire Fade came and sighed, “I am aweary of the green hills ... the fair waters call me.Woe to be a younger brother!” And when Prince Fire Flash took no heed of him, but angled with his rod, day and night, and caught things broad of fin and things narrow of fin, Prince Fire Fade drooped with desire, and let his long hair fall untended upon his shoulders. And he murmured, “Oh, to try my luck upon the sea!” till at last Prince Fire Flash, his elder brother, gave him the rod for very weariness, and betook himself to the mountains. And all day he hunted, and let fly the heavenly-feathered arrows; but rough of hair or soft of hair, never a thing did he catch. And he cried, “Fool, fool, to barter the heavenly luck of the gods!” So he returned. And his Augustness, Prince Fire Fade, took the luck of the sea, and angled in sunshine and in gloom; but broad of fin or narrow of fin, never a fish did he catch. And, moreover, he lost his brother’s fish-hook in the sea. So he hung his head, and returned. At this his Highness, Prince Fire Flash, flewinto a great rage, and stamping his feet, required the fish-hook of his brother. But his elder brother required it of him the more urgently. Then Prince Fire Fade burst the wild wistaria tendrils which bound his august ten-grasp sword to his side. And he said, “Farewell, good sword.” And he broke it into many fragments, and made five hundred fish-hooks to give to his brother, Prince Fire Flash. But Prince Fire Flash would have none of them. And the moon rose so that the sea and the Central Land of Reed Plains was light. But Prince Fire Fade ceased not to lament. So his Augustness, Prince Fire Fade, came to the Sea King’s palace. And he forthwith climbed the cassia tree and waited among its green branches. At the day’s dawning came the handmaidens of the Sea King’s daughter, with their jewelled vessels, to draw water from the well. And as they stooped to dip their vessels, Prince Fire Fade leaned and watched them from the branches of the cassia tree. And the glory of his august countenance made a brightness upon the waters of the well. So all the maidens looked up and beheld his comeliness, and were amazed. But he spoke them fairly, and desired of them a little water from their vessels. So the maidens drew him water in a jewelled cup (howbeit the jewels were clouded, because of the coldness of the well water), and they presented it to him with all reverence. Then, not drinking the water, Prince Fire Fade took the royal jewel from his neck, and holding it between his two lips he dropped it into the cup, and the cup he gave again to the maidens. Now they saw the great jewel shining in the cup, but they could not move it, for it clung fast to the gold. So the maidens departed, skimming the water like the white birds of the offing. And they came to the Sea King’s daughter, bearing the cup and the jewel in it. Then the Princess herself took a vessel and went to draw water at the well. And her long sleeves, and certain of the folds of her august garments, floated behind her, and her head was bound with a garland of sea flowers. And coming to the well she looked up through the branches of the cassia tree. And her eyes met the eyes of Prince Fire Fade. 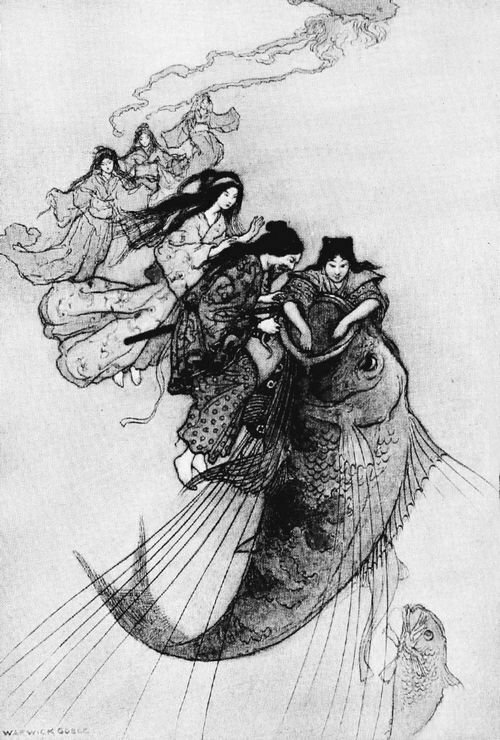 And presently she fetched her father, the Sea King, saying, “Father, there is a beautiful person at our gate.” So the Sea King came out and welcomed Prince Fire Fade, and said, “This is the August Child of the Heaven’s Sun Height.” And leading him into his palace he caused the floor to be spread with eight layers of rugs of asses’ skins, and eight layers of rugs of silk, and set the Prince upon them. And that night he made a great banquet, andcelebrated the betrothal of Prince Fire Fade to his daughter, the fair Jewel Princess. And for very many days there was held high revel and rejoicing in the Sea King’s palace. But one night, as they took their ease upon the silken floor, and all the fishes of the sea brought rich dishes, and sweetmeats in vessels of gold and coral and jade to set before them, the fair Jewel Princess herself sat at Prince Fire Fade’s right hand to pour the wine into his cup. And the silver scales upon the palace walls glittered in the moonlight. But Prince Fire Fade looked out across the Sea Path and thought of what had gone before, and so heaved a deep sigh. Then the Sea King was troubled, and asked him, saying, “Wherefore dost thou sigh?” But Prince Fire Fade answered nothing. Then Prince Fire Fade answered, “My lovely lady, Thine Augustness, let nothing be hidden from thee, because of our love.” And he told them all the story of the fish-hook, and of his elder brother’s wrath. Then the Princess stooped down and lifted the Tai from the water, and with her white hand she took the lost fish-hook from his throat. And after she had washed and dabbled it for a little, she took it in to Prince Fire Fade. And he rejoiced and said, “This is indeed my brother’s fish-hook. I go to restore it instantly, and we shall be reconciled.” For he loved his brother. So Prince Fire Fade sat upon the crocodile’s head; and in one day he came to his own place and sprang lightly to shore. And unsheathing his dagger, he hung it upon the crocodile’s neck for a token. Hereupon, Prince Fire Fade found his brother, and gave him back his own fish-hook that had been lost. Nevertheless, because of the two greatjewels, which he wore in the folds of his raiment, he had everlasting dominion over his brother, and flourished in all his doings. But Prince Fire Fade raised her up and made her welcome, and built for her a palace on the seashore, at the limit of the waves. And the palace was thatched with cormorant’s feathers. So they dwelt there with the August Child. And the fair Jewel Princess besought her lord, saying, “Sweet husband, look not on me in the dark night, for then I must take my native shape; with those of my land it is ever so. Howbeit, look not on me, lest I should be ashamed and misfortune should follow.” So Prince Fire Fade promised her, and spoke many fair words of assurance. Even so, fair is my babe. Add The Sea King and the Magic Jewels to your own personal library.